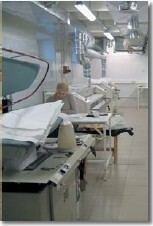 Technologies : Прачечная "Белый медведь"
The latest equipment of the best European manufacturers, like Miele (Germany) and Electrolux (Sweden), is used in the operation. Miele washing machines are well adapted for the washing and disinfection of various types of fabrics, as well as for solving unconventional problems (for example, washing protective gear). Microprocessor control of these machines allows to create a variety of individual programs for each specific task that is received at the fulfillment of each customer’s order. Miele washing machines provide for delicate treatment of fabrics due to the applied innovation licensed drum and the commands that control the water hardness and the adherence to the process parameters. Miele Professional washing machines allow not only deep cleaning of soiled laundry, but, if necessary, its treatment with moisture repellents. Miele dryers have freely programmable control Profitronic and the possibility of program fetch from card, which allows maintaining the drying level in line with the technology innovations. Dryers are also equipped with the licensed drum that considerably reduces the linen wear that is inevitable in the drying process. Electrolux laundry equipment is fitted with microprocessor that allows creating up to 192 programs, setting absolutely all the parameters of washing according to the given task. This gives us an opportunity to create washing programs individually for our clients and store these programs in the machine’s memory. 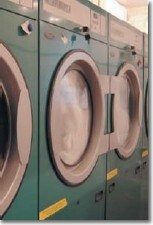 Electrolux dryers safely protect the washing from excessive drying with the function of residual moisture control. Microprocessor equipment helps to adjust 20 drying parameters, which provides ideal match of program with the fabric type, dirtiness stage and tasks given by the client. Our operation never stops! In case of equipment failure we apply to the maintenance service of Avangard Group of Companies – the biggest supplier of professional laundry equipment in Russia. Because of long-term cooperation, the professionalism of the engineers and the availability of all the necessary parts at the storehouse, the maintenance specialists carry out repair in the matter of few hours. This allows us to always meet the deadline coordinated with the client. 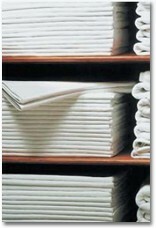 The “White Bear” Laundry and Dry Cleaners applies the detergents of Ecolab - the world leader at the market of professional laundry chemicals. These innovative agents have the highest score of linen treatment quality and they are world famous for their hygienic and environmental qualities. In order for our Laundry and Dry Cleaners to remain one of the most modern on the market we constantly monitor all the new developments that allow the more effective, safe and fast linen treatment. For this reason among other events we visit the world largest exhibitions of cleaning industry in Italy, Germany, Russia and other countries. Besides, we pay much attention to the quality of our personnel work. They go through regular trainings and certification of laundry treatment according to sanitary norms as well as routine medical examination.